My team was able to download, but we can't seem to find the license agreement for it. You know, the wordy document full of legalese? How does one add the icons to the menu? I cannot find this info anywhere on your site. Thank you. Hi, support! 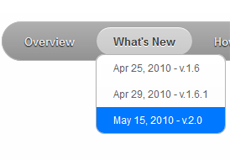 If I purchase you CSS3Menu Unlimited License can I use the program after 1 year? Is there an easy way to place a gradient in the background and the over state of a menu I created in css3menu? ?